General Hospital Spoilers: Mike’s Downward Spiral – Is Sonny’s Father Becoming A Danger To Others? 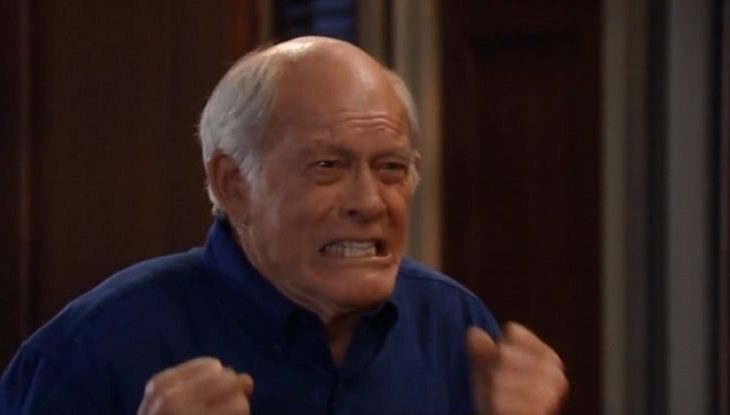 General Hospital spoilers tease that Michael Corinthos (Chad Duell) will take his mother Carly Corinthos (Laura Wright) and his grandpa Mike Corbin (Max Gail) to a nice barbecue dinner this week on General Hospital. But unfortunately Mike will get upset! Michael intends it to be a nice relaxed family outing, with Mike having a trip outside the confines of Turning Woods, where he has moved full time since his Alzheimers’ Disease has progressed. Carly is obviously okay after her ordeal, and out of the hospital as well. Sonny Corinthos (Maurice Benard) is still in Turkey trying to bring Dante Falconeri (Dominic Zamprogna) home. As General Hospital viewers know, Mike recently went into a stage of Alzheimer’s Disease where the sufferer sometimes doesn’t know family, or even who they are themselves. They may still remember the past but will confuse it with the present. Some even seem to hallucinate and have flashbacks similar to a person with Post Traumatic Stress Disorder, also known as PTSD. General Hospital Spoilers: Will Liz Stay With Franco Or Turn To Drew? The last time GH viewers saw Mike, he had problems recognizing who Sonny was and became combative with Marcus Godfrey (Nigel Gibbs) over his wife, Yvonne (Janet Hubert) who Mike thought was his girlfriend. Yvonne thought Mike was her boyfriend and Marcus was her brother! In this stage, the Alzheimers’ patient can also become angry and combative, as he did with Marcus. General Hospital previews for Monday, March 18 show Mike, Carly, and Michael in a restaurant having a meal, but Mike unexpectedly becomes fearful and upset at something. It is more than likely a situation he lived in his past. But he can’t differentiate what he’s experiencing from the present. Apparently, whatever he’s reliving was either very scary, or very urgent, but it’s hard to tell whether he was trying to get away from something, or late getting to something. He just seemingly gets all upset out of the blue, and keeps telling everyone he has to go, and now! Mike seems to be all worked up and Michael and Carly are very concerned. It seems what was meant to give Mike a good time instead got him all upset. Stay tuned to GH and keep checking General Hospital spoilers frequently, to see all the latest news and updates!